Photograph of Charles Darwin by Maull and Polyblank for the Literary and Scientific Portrait Club (1855) via Wikimedia Commons. Tuesday is the 210th anniversary of Charles Darwin’s birth, a day now celebrated by some as Darwin Day. Darwin is best known for his theory of evolution through natural selection. When Darwin’s work was first made public in 1859, it shocked Britain’s religious establishment. And while today it is accepted by virtually all scientists, evolutionary theory still is rejected by many Americans, often because it conflicts with their religious beliefs about divine creation. While not an official holiday, Darwin Day has been adopted by scientific and humanist groups to promote everything from scientific literacy to secularism. This year, dozens of events have been planned worldwide, many of them anchored by scientific talks or symposiums. 2 Around four-in-ten white evangelical Protestants (38%) say humans have always existed in their present form, and about a quarter (27%) of black Protestants share this view, according to the new study. Among white mainline Protestants, just 16% say humans have always existed in their present form. Similar shares of Catholics (13%) and the religiously unaffiliated (11%) say the same. Only among the religiously unaffiliated – those who describe their religion as atheist, agnostic or “nothing in particular” – do a majority (64%) accept evolution via natural selection with no involvement from God or a higher power. 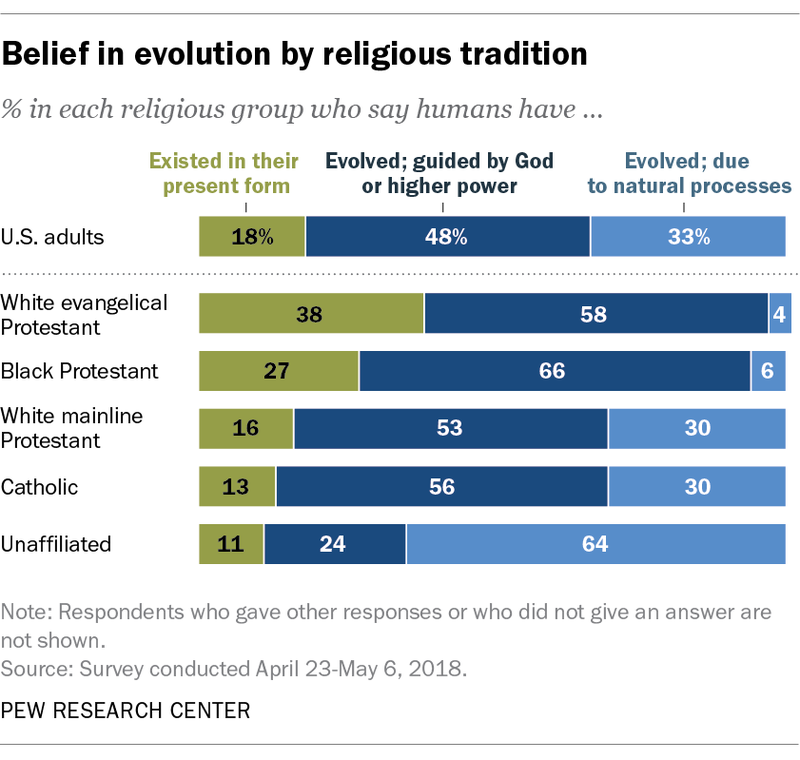 Both Protestants and Catholics are considerably more likely to say evolution was guided or allowed by God than they are to say that humans evolved due to processes such as natural selection, or to say that humans have always existed in their present form. 3 Scientists overwhelmingly agree that humans evolved over time, and most Americans are aware that this is the case. 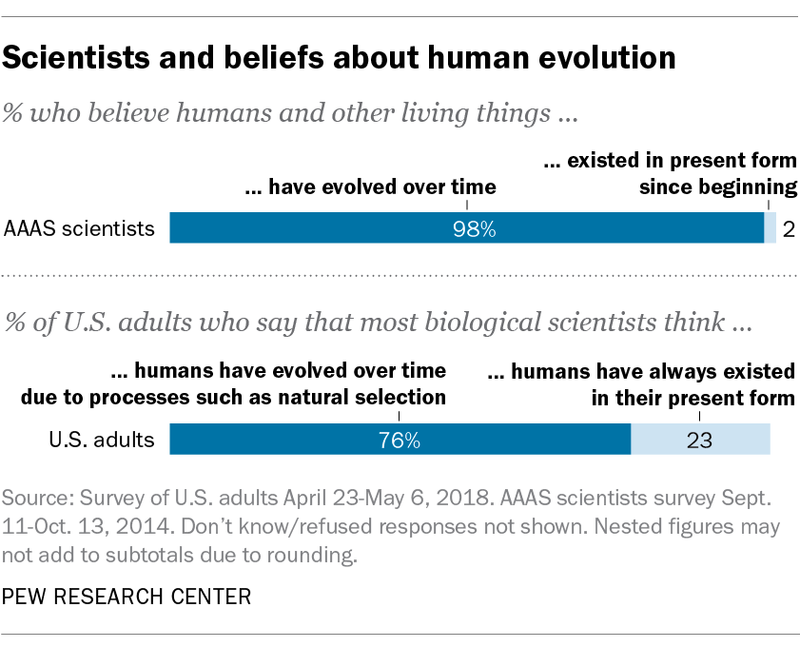 Among scientists connected to the American Association for the Advancement of Science, 98% say they believe humans evolved over time. Roughly three-quarters (76%) of Americans perceive that most biological scientists hold this view, according to the new study. Those in the general public who reject evolution are divided on whether there is a scientific consensus on the topic: 46% say most biological scientists think humans have evolved due to processes such as natural selection, and 52% say most biological scientists think humans have always existed in their present form. 4A series of court decisions have prohibited the teaching of creationism or intelligent design in public schools. In spite of efforts in many American states and localities to ban the teaching of evolution in public schools – or to teach alternatives to evolution – courts in recent decades have consistently rejected public school curricula that veer away from evolutionary theory. In Edwards v. Aguillard (1987), for instance, the U.S. Supreme Court ruled that a Louisiana law requiring public school students to learn both evolution and creation science violated the Constitution’s prohibition on the establishment of religion. 5While most Americans (59%) say science and religion are often in conflict, those who are more religiously observant are less likely than others to see this clash between faith and science, according to a 2015 Pew Research Center survey. Among those who attend church at least once a week, half (50%) view religion and science as in conflict, compared with nearly three-quarters (73%) of those who seldom or never attend worship services. At the same time, most people (68%) say that their own personal religious beliefs do not clash with accepted scientific doctrine. 6Outside the U.S., there are many other countries where sizable shares of the population reject evolution. In Latin America, for example, roughly four-in-ten or more residents of several countries – including Ecuador, Nicaragua and the Dominican Republic – say humans and other living things have always existed in their present form. This is true even though the official teachings of Catholicism, which is the majority religion in the region, do not reject evolution. In Central and Eastern Europe, evolution is broadly accepted, but roughly half or more of adults in two countries – Armenia and Bosnia – reject it. Meanwhile, Muslims in many nations are divided on the topic, although majorities of Muslims in countries such as Afghanistan, Indonesia and Iraq reject evolution. It’s important to note that our international surveys have used a different approach to ask about evolution, so results are not directly comparable to our new U.S. survey (although some of our older U.S. surveys used similar questions). Note: This is an update to a post originally published on Feb. 12, 2015.